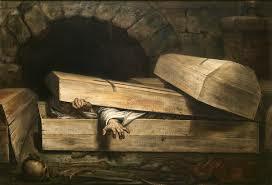 Before modern medicine, being buried alive was more than just an idle phobia. It actually happened. A lot. Common procedure for dealing with an unconscious person was to hold a glass pane to his or her mouth. If the mirror stayed dry, the soul had departed. If it fogged up, there was life yet. But this primitive test was unreliable, prone to false positives and a diagnosis of death for comatose patients, who often awoke to find themselves in a box underground. One concerned claustrophobe took up the cause. On March 1, 1893, Iowan inventor August Lindquist filed a patent for a “grave alarm,” a bell on a string designed to help the interred alert passersby if they had been mistakenly buried alive. Lindquist designed the string to run slack along the body, within easy reach of the corpse. He also outfitted the system with snorkel-like piping to funnel fresh air into the coffin, able to sustain the body until help arrived.